Dr. Alexander Gottschalk is a renowned radiation oncologist in San Francisco, California. He received his medical diploma from the University of Chicago Pritzker School of Medicine in 1996. After getting his medical degree, he did an internship at Kaiser Permanente Medical Group. Dr. Gottschalk completed his medical education with a residency in radiation oncology at UCSF. He is certified by the American Board in radiation oncology and his subspecialty is general radiation oncology. 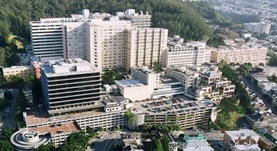 This doctor is affiliated with several hospitals in the area, including: UCSF Medical Center Mount Zion, Zuckerberg San Francisco General Hospital and Trauma Center and San Francisco Veterans Affairs Medical Center. He was awarded the honor CMS Stage 1 EHR in 2013. He has published a huge number of articles in collaboration with other doctors. Dr. Alexander Gottschalk has contributed to 3 publications. An Evaluation of Robotic and Conventional IMRT for Prostate Cancer: Potential for Dose Escalation. Pinnaduwage, D. S.,Descovich, M.,Lometti, M. W.,Varad, B.,Roach, M.,Gottschalk, A. R.; Technol. Cancer Res. Treat.. 1900 Jan 01. Comparison between target margins derived from 4DCT scans and real-time tumor motion tracking: Insights from lung tumor patients treated with robotic radiosurgery. Descovich, M.,McGuinness, C.,Kannarunimit, D.,Chen, J.,Pinnaduwage, D.,Pouliot, J.,Kased, N.,Gottschalk, A. R.,Yom, S. S.; Med Phys. 2015 Mar 05. Dose-volume analysis and the temporal nature of toxicity with stereotactic body radiation therapy for prostate cancer. Seymour, Z. A.,Chang, A. J.,Zhang, L.,Kirby, N.,Descovich, M.,Roach, M.,Hsu, I. C.,Gottschalk, A. R.; Pract Radiat Oncol. 2015 Mar 22.